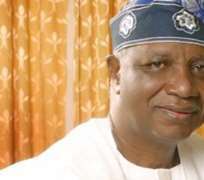 Mr Feyi Agagu, the first son of the late Dr Olusegun Agagu, a former governor of Ondo State, on Saturday said his father was hypertensive.NAN reports that Agagu, who returned from United States on Thursday, reportedly slumped in Ikoyi, Lagos, where he was having a meeting with Ondo indigenes on Friday evening. 'He just had a medical examination, which showed that he had a little cholesterol, and was hypertensive. 'There is diabetics in our family, but it's nothing major; it was just something he had been dealing with for the past 10 to 15 years. So, there was no inkling that something was about to happen,' Agagu said.According to him, his mum has lost her best friend and her husband. He confirmed that his father passed away in Lagos on his way to St Nicholas Hospital.He added that his father had the usual illness that comes with age, 'so there was no stand out cause for his passing'. 'He lived a simple but a fulfilled and happy life. He left amazing memories and fantastic legacies behind. 'I will miss the friendship, I will miss the advice; he was pretty much anything any wife, son or daughter could ask for in a father. 'He was a mentor to many, a brother, a benefactor; I'm sure a lot of people will miss him,' he said. Agagu said the family had just returned for their annual two and a half weeks family vacation and during that time his father showed no sign of illness. 'I guess when it's time to go, when your maker comes to get you, when he brought you, he did not ask anybody, so he can take you when he sees fit,' he said.He said that arrangements for the burial were yet to be made. In his response to the development, Chief Olagunsoye Oyinlola, a former Governor of Osun State, said he was 'grieved'. 'We met in politics and he remained a very nice senior colleague and when he came back two days ago, we talked about a meeting tonight,' Oyinlola said on Saturday.